With ample footprint for your logo and custom artwork, these promotional die cut plastic bags are sure to adapt to your marketing efforts. These die cut plastic bags are perfect for your upcoming marketing campaign, ensuring your business is recognized as it should be. With ample footprint for your logo and custom artwork, these promotional die cut plastic bags are sure to adapt to your marketing efforts. 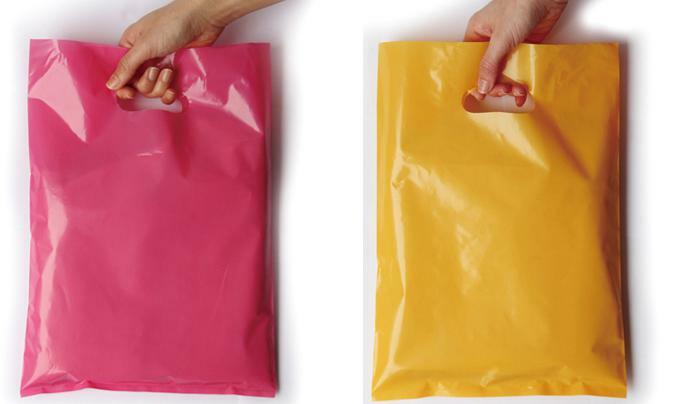 These die cut plastic bags come in a variety of colors and sizes. These personalized shopping plastic bags are printed in a gorgeous way to ensure your logo stands out from the rest. Show your shoppers elegant promotional tools, attract them and remind them of your services and products! - Multi colour custom printing. - Good toughness and bottom sealing strong. - Very suitable for clothing, shoe, accessories, etc. - Height, width & gusset can be customized. - The surface is smooth, hand feeling is good, have good toughness. - Various handle configuration including die cut, reinforced patch & loop handles. - Excellent processing technology, more exquisite printing and more clear graphic.